Representative Theresa Mah met with students from the RSO, Panasia. Theresa Mah of the Illinois House of Representatives spoke Thursday at the Center for the Study of Race, Politics, and Culture (CSRPC) about a campaign for expanding Asian American Studies opportunities at the University of Chicago. Mah (Ph.D. ’99) was elected in 2016 as Illinois’s first Asian-American legislator, and holds her doctorate in history from the University of Chicago. 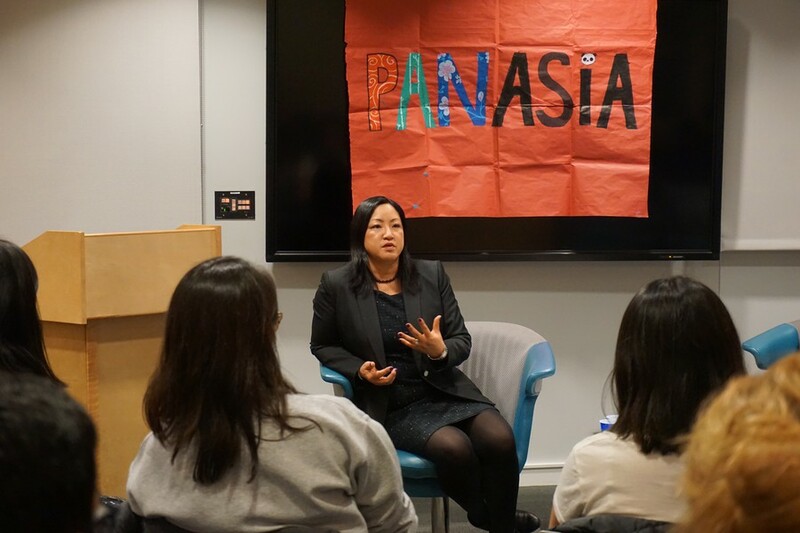 The event, organized by PanAsia President Raymond Fang, a fourth-year in the college, was the second in a series of events aimed at organizing an independent task force for Asian American Studies advocacy. The event series’ short-term goal is to organize students to advocate for more classes in Asian American Studies (2–3 per quarter), and the long-term goal is to establish a more robust Asian American Studies minor within the Comparative Race and Ethnic Studies program. Mah said she faced limited access to Asian American Studies as a Ph.D. student focusing on United States history. “I didn’t have the opportunity to learn from other scholars of Asian American Studies while I was here at the graduate school.... I was kind of self-taught at the graduate level,” she said. Mah was involved with the creation of the Comparative Race and Ethnic Studies (CRES) program in 2009, which absorbed the previously independent African and African-American Studies major and minor as a concentration within the course of study. The major allows for specialization in African American Studies, Asian American Studies, Latina/o Studies, and Native American studies. The CRES program was created to allow for specialization in a wider range of offerings, according to Mah, whose involvement stemmed from the importance of Asian American studies in her own life. “I don’t think I would be here today if I didn’t have the opportunity to take Asian American Studies classes,” she said. While it is, in fact, possible to major in CRES with an emphasis in Asian American Studies, Mah is correct about the shortage of courses available. A current fourth-year CRES major is concentrating in Asian American Studies, and another graduated last year, but both used related courses in sociology, Chinese history, and Chinese language to supplement Asian American CRES courses offered by the CSRPC. Sarah Tuohey, the student affairs administrator of the CSRPC and the Center for the Study of Gender and Sexuality, acknowledged the need for more courses in the department. “Though both students were able to put together a major and work with faculty B.A. advisers who focus in part on Asian American studies…clearly both would have welcomed the opportunity to take more courses that focused primarily on Asian American topics. CRES and the CSRPC support students’ desire to have a more robust Asian American Studies curriculum and we would like to help the efforts in that direction,” Tuohey said. Current faculty whose scholarship focuses on Asian and Asian American Studies includes Professor Bruce Cumings and Assistant Professors Matthew Briones and Kimberly Hoang. The Asian American Studies major at Northwestern was created in 2016 after over 20 years of student activism including a hunger strike in 1995. Mah recommended a “multi-pronged approach” to advocating for more Asian American Studies classes at the university, including putting pressure on the administration for more courses, voicing interest to those who sit on graduate admissions committees for the hiring of more Asian American Ph.D. candidates, and looking at racial employment metrics by department, not just overall. In conversations with the dean and provost of the University, Mah has pointed out trends in Asian American faculty hiring, which is heavily skewed toward the hard sciences and medicine. Editor’s note: Raymond Fang is a former associate news editor of The Maroon.